Time is a Thief. It stole my baby! Time is not a constant. Sometimes it moves very slowly, like when you are waiting in line at the post office, tortured by seconds. There are devices meant to slow time even further. Have you ever spent 20 minutes on a StairMaster? And sometimes time races by. It’s already Spring! Today is my father’s 73rd birthday. I remember his 30th birthday and thinking he was so old. That was about 5 days ago. The people who know the most about the flexibility of time are athletes. Races are won in hundredths of seconds but a well-covered wide-receiver catching a football feels it all happens in extreme slow motion. I remember a street survey about basketball great Michael Jordan. They asked people what they thought his top hang-time was, from when his feet left the ground to when his hand slammed the ball in the basket. Answers ranged from 5 seconds to over a minute. His record hang-time was 0.928 seconds. Parents know this time flexibility so well and now I do as well. The mantra, “They grow up so fast” gets uttered multiple times a day. It’s insane. Just yesterday, Cozy was a little blob, swaddled in a cradle. 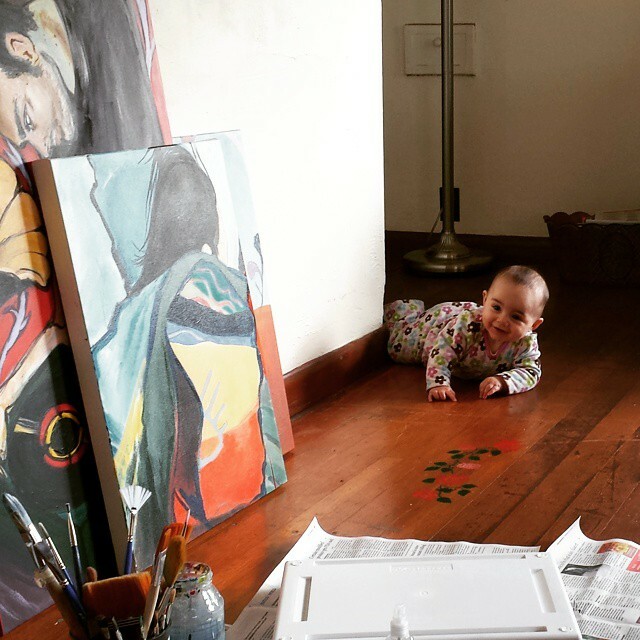 Today she is a 35 week old kid, scooting across the floor, curious what’s around the next corner. And yes, I’m still counting weeks. Seven months and 6 days if you prefer. I’m one of those parents. How old is your daughter? She’s 156 months. Oh, you mean 13. Gotta slow time down. This weekend we went to Target and bought a Magic Bullet so we could start making our own baby food for Cozy (and Piña Coladas for us). She’s eating the same things we are now. (OK, you can refer to the earlier post on breast milk, which now has over 3200 hits.) Last night we all had chicken soup. 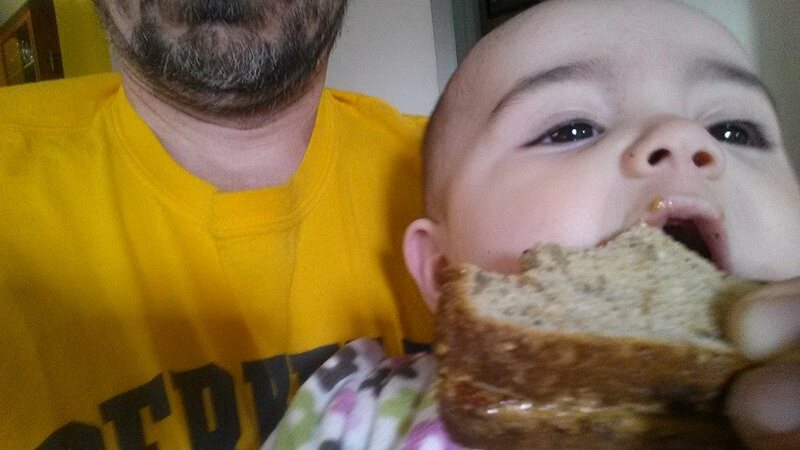 This morning she shared my PB&J sandwich. Who is this person? I know how we anthropomorphize our animals (My cat prefers French impressionism), so I am aware I may be writing more into this child’s brain than is actually there. Regardless, I often feel like she is now a fully formed person with her own opinions and tastes. Maybe time is moving too slow and I want to hurry up and have a conversation with her about what a douche Ted Cruz is. Or maybe time is moving too fast, and I’ve forever lost those times when I could just stare at her and not worry what household danger she is crawling towards. There’s a BB King lyric that goes, “Oh, time is a thief that will rob you of your years. And never return one yesterday.” I just want a snapshot of this moment before it blows away. Cozy has peanut butter and jelly on her face for the first time. Where does the time go? Reblogged this on Indiana Dad.